First Aid Call – On June 17, 2015 at 7:40 am, Sgt. Frank Melillo, Patrolman Andrew Altman, and Patrolman Allen Magory were dispatched to a Beachwood residence after the caller reported that a female had just given birth to a baby. Upon the arrival of the officers along with Beachwood First Aid the mother and baby were checked on and stabilized. Beachwood Police and First Aid transported mother and baby to hospital. D.U.I. Arrest – On June 17, 2015 at 6:30pm, Patrolman David Bowden and Sgt. Derek Mussari were dispatched to a suspicious vehicle at the intersection of Surf Ave., and Elm Street. Upon their arrival the vehicle was located parked in the roadway on Elm Street. Upon speaking with the driver and after further investigation, it was determined that Shawn Kennedy, 37 of Roosevelt Ave, Bayville was under the influence. As a result he was arrested and processed at Beachwood Police Headquarters, and released after being issued several motor vehicle summonses. The matter is pending a court proceeding. Burglary/Theft – On June 18, 2015 at 12:50pm, Patrolman Justin Apel responded to a residence on Locker Street where a resident was reporting items stolen. The resident reported that a laptop and video games were removed from the residence while they were out. Anyone with information is asked to contact Detective Adam Griesemer at 732-286-6000 ext. 191. Fire Call – On June 18, 2015, Beachwood Police and Beachwood Fire personnel responded to the area of the 1300 block of Neptune Ave., for a smoke condition in the area. Upon further investigation it was determined that the smoke condition was the result of an outdoor firepit/fireplace at a residence. Joshua Golden, 33 years old, Lookout St., Beachwood; charged with possession of heroin with the intent to distribute, possession of CDS and possession of drug paraphernalia. Bail was set at $25,000.00. Deandre Cannon, 23 years old, Lookout St., Beachwood; charged with possession of heroin with intent to distribute, possession of CDS. Bail was set at $50,000.00. Elizabeth Bunje, 25 years old, Windsor Place, Forked River; charged with possession of heroin with the intent to distribute, possession of CDS. Bail was set at $75,000.00. D.U.I. Arrest – On June 19, 2015 at approximately 6:00pm, Patrolman David Bowden was dispatched to the area of Harpoon Street for a suspicious vehicle. The officer located the vehicle and spoke with the driver, Emma Keczkemethy, 19 of Pine Beach and it was determined that she was under the influence. As a result of Patrolman Bowden’s investigation the driver was arrested and transported to Beachwood Police Headquarters for processing. The driver was charged with Driving While Intoxicated, along with several other motor vehicle violations. An additional charge of aggravated assault was lodged against the driver after she spit on the officer during the arrest. Sgt. Derek Mussari assisted at the scene. 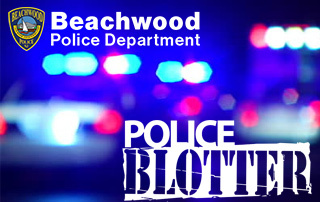 Warrant Arrest – On June 20, 2015 at 2:32 am, Patrolman Chad Anthony conducted a motor vehicle stop in the area of Beachwood Boulevard and Wave Street. It was determined that the driver, Jose Montesxelhua, 35 of Bayville had an outstanding warrant from Berkeley Township. The driver was arrested and transported to Beachwood Police Headquarters where he was processed and released R.O.R. pending court. Warrant Arrest – On June 22, 2015 at 10:10pm, Patrolman David Bowden was met at Beachwood Police Headquarters by a female identified as Michelle Faronea, 38 of Beachwood at which time it was learned that she had an outstanding warrant from Toms River. The female was arrested and turned over to Toms River Police Department. Theft – On June 23, 2015 at 6:10pm, Sergeant Derek Mussari responded to a residence on the 700 block of Capstan Avenue for a theft report. Upon his arrival, the resident reported that a cell phone was stolen from their mailbox sometime during the overnight hours. Fire Call – On June 23, 2015 at approximately 8:00pm, Officer Gina Bruno responded to the area of Bowline Street and Beachwood Boulevard along with the Beachwood Fire Department for a possible transformer fire. Upon the arrival of emergency personnel it was determined that there was no fire and no power outage at that time. The incident was reported to JCP&L for further investigation.